Contain the mess and do it in style! 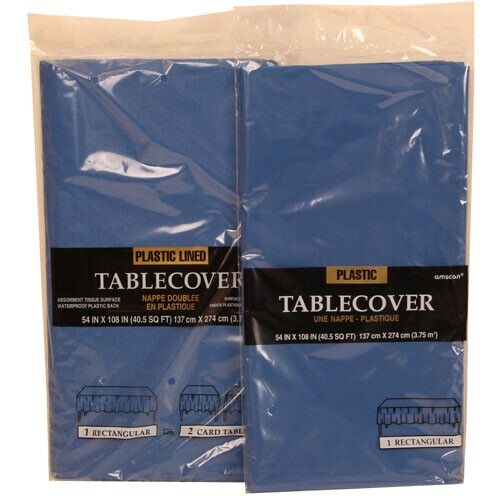 With these Blue Tablecovers, your tables will be dressed to impress. No theme is complete without matching table covers. They might not be the focal point, but they surely will compliment! Perfect for Hanukkah parties, New Years Eve bashes, birthday extravaganzas, Fourth of July barbecues and more. Blue Table Covers will add a cool look to your party and keep you cool at the same time. In other words, you won't have to stress about a disastrous cleanup! Once the party is over, all you'll have to do is grab the corners and throw it away! Blue Table Covers feature a large rectangular shape (54 x 108 inches or 40.5 square feet) allowing them to cover most any table. Blue Table Covers come in either plastic or paper. Both come in an option of Navy Blue and Sea Blue, so whether you want to go classic or vibrant is up to you!